Create self expiring login links for people hired to do a particular job for you. Using these links, they can login to your WordPress website without the need of a username and password. 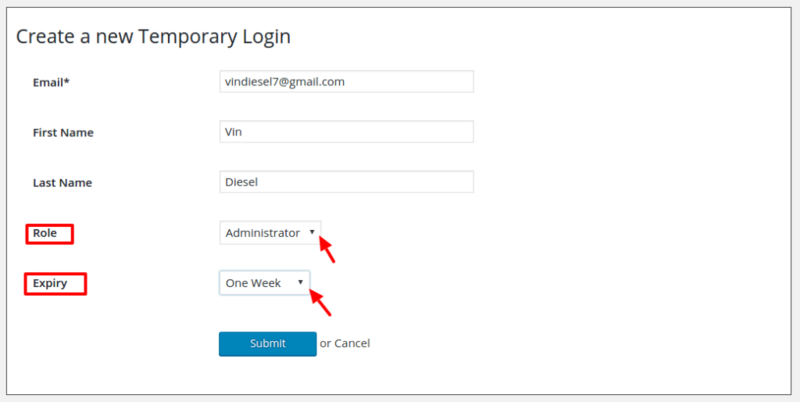 Create self-expiring, automatic login links for WordPress websites. Give access to developers, editors or other users to perform the necessary tasks. No password needed. Administrator/Developer– Perform changes on websites – plugin fixes, theme modifications, code debugging, etc. They need access to your admin area. Shop Manager– Perform tasks related to inventory. Subscriber/Customer– May need help anytime from you. Let them have their own accounts on the site so that they can reach out to you for support anytime. Author/Editor– Write or review posts. and in many other cases, you need different users to complete a particular task. Let’s face this! You can’t do all the work single-handedly. You may not have expertise in all fields as well. Most importantly, you have a business to run and manage. And you can’t afford to spend time to do all these work frequently. Hence, you need to create and provide temporary admin access to these users. Now, giving credentials to an outsider is always risky and a time consuming process. Risky in the sense they can breach your website security at any point of time – visit pages which they shouldn’t, keep on changing login details, etc. Nevertheless, the hours of anxiousness you face after that is even more painful. Right? Click the ‘Add New User‘ button. Once the work is done, you must delete that temporary admin account without fail for security reasons. Therefore, there was a need to create a solution to relieve users from this pain. The Temporary Login Without Password plugin eliminates this tiresome, lengthy painful procedure of creating and deleting temporary WordPress accounts. The Temporary Login Without Password plugin provides a login process which is secure, fast and smooth and where there is absolutely no need of password. Using this plugin, you can create a self expiring special login link which, users can login to your WordPress website without the need of a username and password. You can choose the login expiry date as well as the user role of the temporary account. A bang on solution for any site owner. Having multiple accounts on your site leaves it vulnerable to security threats and data safety issues as you have given freedom and privileges to users on your site. But with Temporary Login Without Password plugin, you can have sound sleep and worry less as these logins are temporary and they get disabled automatically after a certain period of time. Enter the email address of the person, followed by their first name and last name. Select a user role for the user from the drop down menu– administrator, shop manager, customer, subscriber, contributor, author or editor. Choose expiry duration for this temporary account– one hour, three hours, one day, three days, one week or one month. This is the period after which the account will automatically expire. Click on ‘Submit’ to save your changes. The plugin also makes it easier for you to manage temporary logins. Simply visit the Users>Temporary Logins page, and you will see the list of temporary logins you have added to your site. For each account, you will be able to see the user’s name and email address along with the role assigned to them, last login date, and time remaining till account expires.